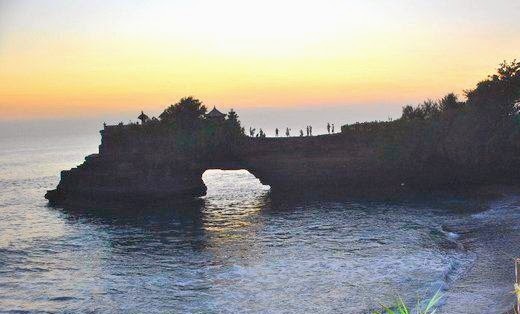 Pura Batu Bolong is part of the beauty of the attractions of Tanah Lot Bali. This temple is located in the west of Pura Tanah Lot. PuraBatuBolong is a temple situated on the rock that is shaking out to sea. Rock has a big hole in the bottom. Hole in the Balinese language called boolong. That is why it is called with Pura Batu Bolong temple. Pura Batu Bolong in Tanah Lot Bali became a part of the natural beauty in Tabanan. The temple became a part of the beauty of the sunset in Bali. Large rock protruding into the sea. When the tides, the hole in the bottom of large rock in Pura Batu Bolong be inundated by sea water. The hole into a gap and a great place to see the sunset. Pura Batu Bolong be an amazing tourist attraction in Tanah Lot Tabanan. During a ritual by local residents in the temple. From a distance looks row above the shelf was walking hand in hand with bringing offerings. Pura Tanah Lot not just a temple to worship for Hindus in Bali. But also become a tourist attraction. Also on Pura Batu Bolong, into a worship place for Hindus in Bali. Pura Tanah Lot and Pura Batu Bolong are two temples are interrelated. Not only as a holy place, as well as a protector of the island, and into confidence for the people of Bali. This temple is made to protect the island from the negative influences that come from the sea. Just like other temples around Bali region contained by the sea, Pura Batu Bolong Tanah Lot also be protective for Bali. If the tide is low, the tourists can take a walk on the beach towards the recurrent under Pura Batu Bolong. Parts of it are often used for taking photos by the photographer who Suja with natural beauty. Perforated section on Pura Batu Bolong also be a great spot for a sunset photo models with a background in Tanah Lot, Tabanan Bali, Indonesia. Pura Batu Bolong also exist in Lombok. Pura Batu Bolong in Lombok, is considered as the second Tanahlot after in Bali. This temple is very beautiful with a very clean sea water. Unlike the Pura Batu Bolong in Tanahlot Bali is by the sea with a very large sea waves. Pura Batu Bolong Lombok were at sea with sea waves are very small and quiet. Pura Batu Bolong Lombok located on Senggigi Beach, the temple has become one of the tourist destinations most visited, as well as a very interesting Senggigi Beach, the temple is on the seashore is a temple that is so exotic. This temple is located in an attractive cluster of rocks. Residents around make this beach as a spot for fishing. Just as there are in Lombok, Pura Batu Bolong Tanah Lot also be the location of fishing by local people. Sea around this temple has a lot of fish. Although a very large ocean waves, but many people are fishing around this beach. The fish in the sea is very large when compared to other beaches in Tabanan. Because the rock is a place for fish to find food.